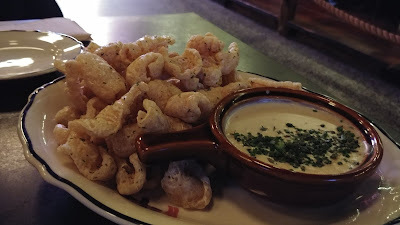 Pork Rinds (sour cream & onion pork rinds w/ beer cheese). Usually, I don't eat too many of these. This time, I couldn't stop. The sour cream and onion flavor was excellent and the beer cheese dip was even better. 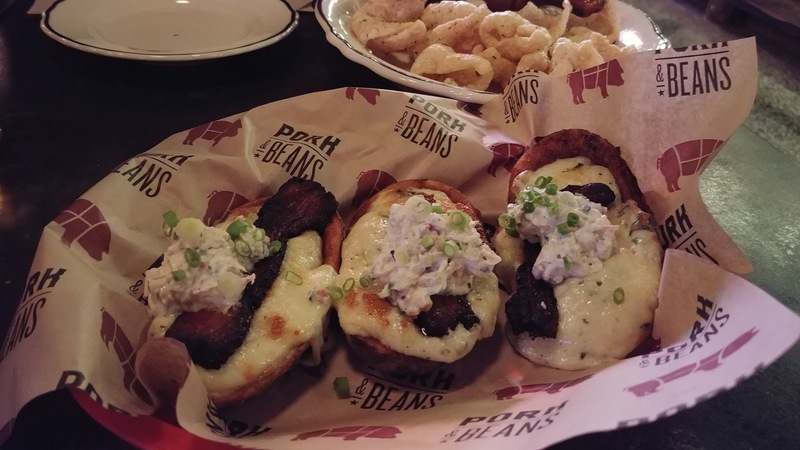 Pork Belly Potato Skins (jarlsberg spread, cheese curds, bacon-sour cream, scallions). Oh my gosh these are good. Cheesy. Bacony. Cool sour creamy. Probably one of my top favorites dishes at restaurants that we go to. SP chose a special of the day, a Sausage Platter. There were 4 possible sausages and you got to choose which 3 you wanted. He chose Breakfast Sausage with maple, Lamb Sausage with pepper and paprika, Cod Sausage with potato. 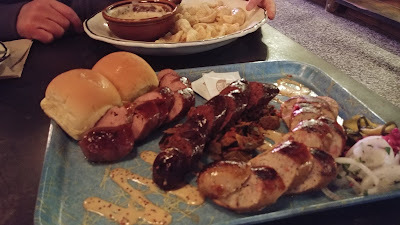 I tried small bites of the Breakfast (really good, nice maple flavor) and lamb (also quite good). These were yummy. A smoother texture than most sausage. I never thought I'd call sausage light, but they tasted lighter than most sausage. I ordered Brisket Grilled Cheese (caramelized onion, cheese whiz, American cheese). So. Good. Almost better than my all-time favorite sandwich, the 3 Little Pigs at Meat & Potatoes. 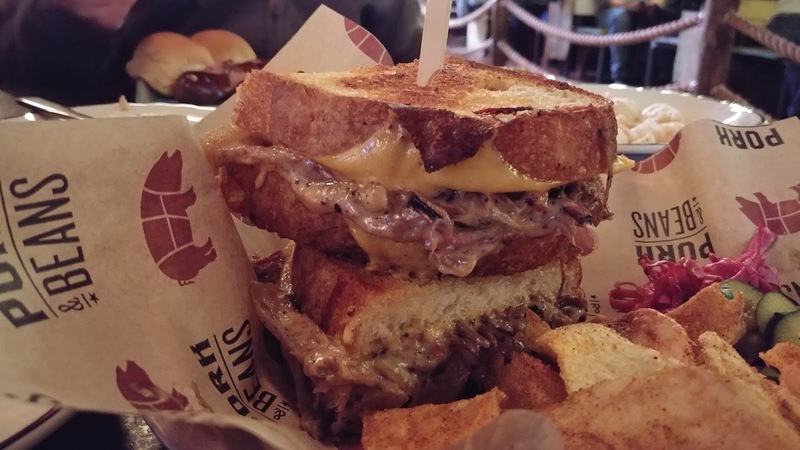 So much ooey, gooey cheese, tasty shredded brisket, sweet caramelized onions. We enjoyed our second visit to Pork & Beans. The food was delicious. 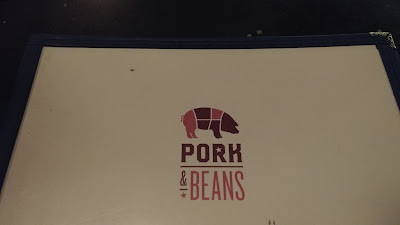 Our server was friendly and knowledgeable. 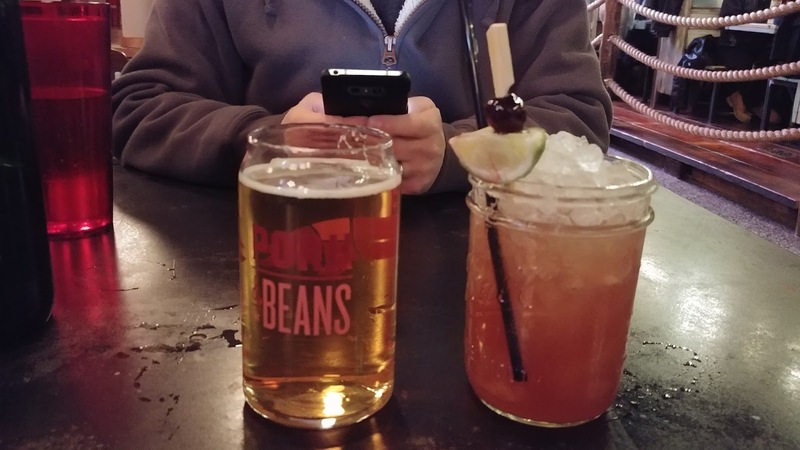 Hopefully we'll be back at Pork & beans before another entire year passes.